LDL (low-density lipoprotein) levels above 160 mg/dL in the patients otherwise deemed at low risk for cardiovascular disease (CVD) face a 50% to 80% increased relative risk of CVD mortality over the long term. 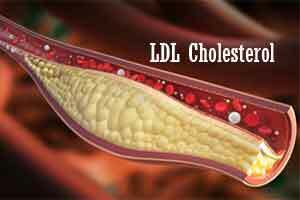 Findings, published in the journal Circulation may have implications for future cholesterol treatment paradigms. The associations of low-density lipoprotein cholesterol (LDL-C) with CVD and coronary heart disease mortality in an exclusively low estimated 10-year risk group are not well delineated. Shuaib M. Abdullah, Department of Internal Medicine, University of Texas Southwestern Medical Center, Dallas, and colleagues conducted the study to determine the long-term associations of various LDL-C and non–high-density lipoprotein cholesterol (HDL-C) thresholds and CVD and coronary heart disease mortality in a large, low 10-year risk cohort. For the study, the research team measured lipid levels of over 36,000 adults in Texas (median age, 42) with an estimated 10-year risk for atherosclerotic CVD events below 7.5%, and followed for a median of 27 years. About 1086 CVD and 598 coronary heart disease deaths occurred. Compared with LDL-C <100 mg/dL, LDL-C categories 100 to 129 mg/dL, 130 to 159 mg/dL, 160 to 189.9 mg/dL, and ≥190 mg/dL were associated with a significantly higher risk of CVD death, with hazard ratios of, and mean reductions in years free of CVD death of 1.8, 1.1, 4.3, and 3.9, respectively. After adjustment for atherosclerotic CVD risk factors, LDL-C categories 160 to 189 mg/dL and ≥190 mg/dL remained independently associated with CVD mortality, with hazard ratios of 1.7 (95% CI, 1.4–2.2) and 1.5 (95% CI, 1.2–2.1), respectively. In multivariable-adjusted models using non–HDL-C <130 mg/dL as the reference, non–HDL-C 160 to 189 mg/dL, 190 to 219 mg/dL, and ≥220 mg/dL were significantly associated with CVD death, with hazard ratios of 1.3 (95% CI, 1.1–1.6), 1.8 (95% CI, 1.4–2.2), and 1.5 (95% CI, 1.2–2.0), respectively. Restricting the cohort to those with 10-year risk <5% did not diminish the associations of LDL-C and non–HDL-C with CVD mortality. Very important cut off value for LDL C.